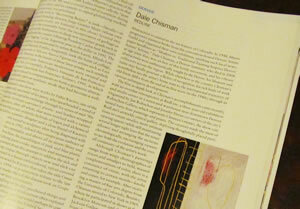 The Summer 2011 edition of ArtForum International includes a review of the Dale Chisman In Retrospect exhibition by Kyle MacMillian. ... As Chisman found relevancy in AbEx into the new millennium, his practice continues to be a significant touchstone for scores of younger artists in Colorado and beyond." 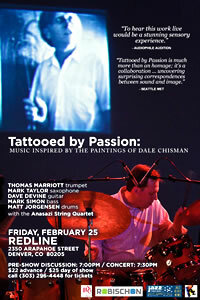 Robischon Gallery and RedLine present a live performance of Matt Jorgensen's Tattooed by Passion: Music inspired by the paintings of Dale Chisman during the closing weekend of Dale Chisman In Retrospect. Call (303) 296-4448 for tickets or buy online. In partnership with the Dale Chisman Estate and Robischon Gallery, Redline presents "In Retrospect: Dale Chisman." Among the artists to emerge in Colorado during the 1980's, Dale Chisman occupies a stellar position -- a position of achievement that is fused to his authoritative and generous intelligence and to his ability to risk everything on each painting-adventure. He is in a place by himself. The surprisingly diverse ways his influence has taken hold is ample proof of this statement. He deeply affected the evolution -- if not the look -- of contemporary art in Colorado. 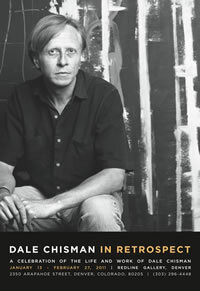 For that and for the freshness and intelligence of his work he deserves this posthumous retrospective. Rebecca Chisman, daughter of the late-Denver abstract artist Dale Chisman, is pleased to announce the up-coming release of Dale Chisman In Retrospect, the companion book for the exhibit of Chisman's work at RedLine on January 13 - February 27. You can preview the book below and/or order the book direct from Blurb. Use promo code SHARE on checkout to receive free flat-rate shipping. DRUMMER MATT JORGENSEN RELEASES, "TATTOOED BY PASSION: MUSIC INSPIRED BY THE PAINTINGS OF DALE CHISMAN"
Click here for to view more information about the CD and listen to sound clips.